This lavishly illuminated codex belongs to the intermediate period in the development of the Psalter and the Book of Hours when the offices around the Hours of the Virgin were gradually becoming more important than the Psalter itself. 131 x 95 mm. – 316 leaves. With 13 historiated initials, 12 calendar illustrations and 7 full-page miniatures (in two registers). 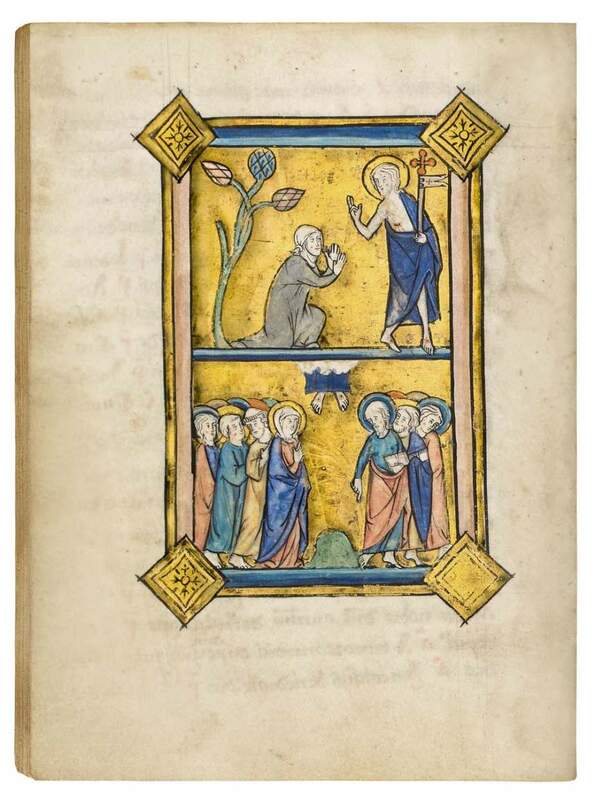 Seven exquisite full-page miniatures on burnished gold - each divided into two registers - precede the text of this rare and remarkable Brabantine Psalter-Hours. Although the main subject of the sequence is the Passion of Christ, it is introduced by the debate that Jesus and the devil had in the wilderness when Christ resisted Satan's various temptations. The next scene shows the supper at Bethany when Mary Magdalene anointed Christ's feet with perfume and dried them with her long hair, an event that happened six days before Passover as recorded in the Gospels of John 12 and Luke 7. This story is considered to be a prefiguration of Jesus' death and burial. Apart from these rich full-page miniatures the Psalter has twelve scenes that accompany the calendar, which includes many Mosan feasts and celebrates Gudule of Brussels, Gummarus of Lierre, and Waldetrudis of Mons. Moreover, thirteen large historiated initials - also on gold ground - mostly with scenes of martyrdom, mark the incipits of the psalms and the offices. The models for the illuminations are inspired by Flemish compositions whereas the style points to a Hainault workshop. In the 13th century, the profitable wool trade to Brabant had made Brussels, Mechelen, Lier, and Louvain into flourishing centres and Antwerp became a major port, while, in the same time, the dukes of Brabant also gained control of the route from Bruges to Cologne. The prosperous towns were all centres of some manuscript production that continued to flourish well into the last decades of the 13th century. Brussels, the favoured residence of the dukes, grew into a government centre and, by the 14th century, gained first place among Brabantine towns. Illuminators, trained in the school of Hainaut in the south, came north in search of new patrons. Present-day Belgian Hainaut thus shared in the creativity and productivity of French Hainaut in the south. Subsequently, artists brought successive stages of the evolution of the Hainaut style north, where these foreign artists were quite willing to yield and adapt to local preferences in the layout and iconographic themes of their Psalters. Interestingly the book was later adapted for Augustinian use in Cologne, possibly the convent of the Albas Dominas (White Women) of St. Mary Magdalene. In the 19th century, one of the bibliophile Princes of Fürstenberg acquired the book for the Court Library at Donaueschingen.